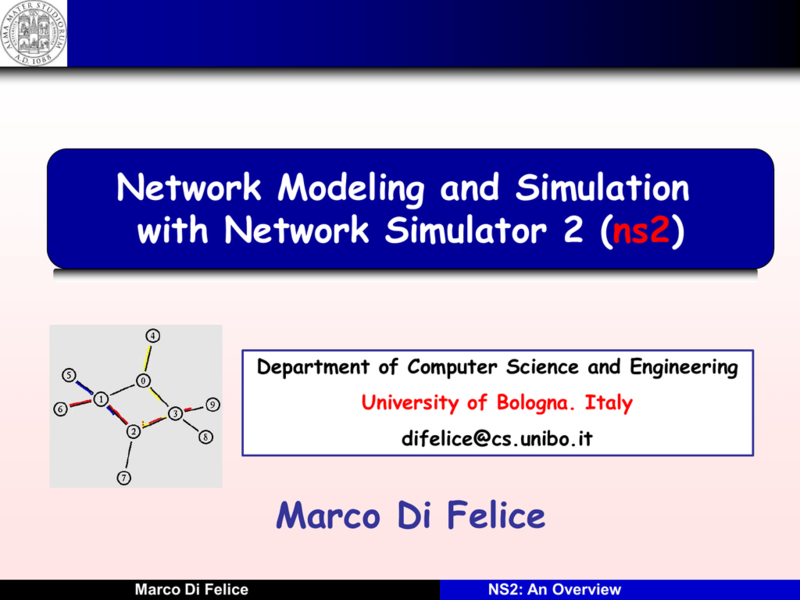 NS2: A (discrete event) network simulator tool. network as a whole (e.g. a wireless LAN). Q. 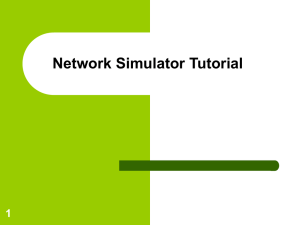 When may I use a network simulator? Quality of Service (QoS) issues. TCP variant for wireless LANs. feasible, or might be too costly. of the scenario under study. evaluation technique for wireless systems. (hard to guarantee with wireless testbeds). only when it produces “trustable” results. and dynamics of the system under study.  HOW to VALIDATE a NETWORK MODEL? California), but several forks available.  A completely new tool, not a mere extension of Ns2 ! Q. 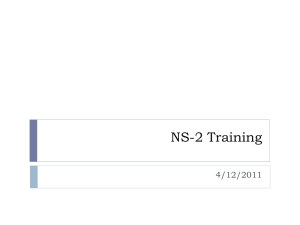 WHY should I use NS2 for my research? 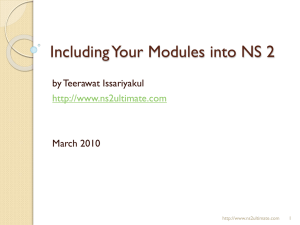  NS2 includes a vast model library of network components. implemented by other research teams. 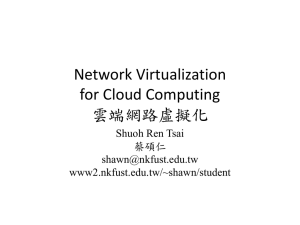 working on the field of computer networks. within the papers submitted at the ACM MOBIHOC conference (2000-2006). Q. 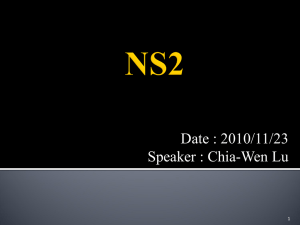 WHY NOT to use NS2 for my research? scalability constitutes a big issue.  No support for the trace analysis.  Two programming languages: C++ and OTCL.  Basic implementation, few optimization. 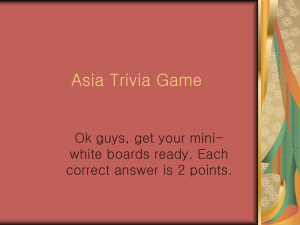  The Scheduler manages the simulation event list.  The elements are the events of the simulation.  The list is ordered on the basis of the time field. 3. The event handler (E1.handler) is executed. - Recompile at the end. - Executed by an interpreter, no need to recompile. CASE 1. 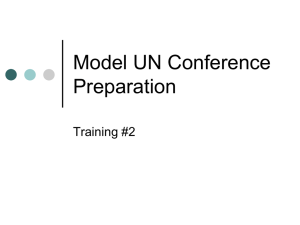 Modeling a wired network. to Agent/Null, i.e. they are discarded. CASE 1. Modeling a wireless network. about the state of the environment (e.g.  Any mobility simulator can be used for trace generation. configuring the protocol stack of each node. AODV, DSDV, DSR, TORA, ….  In C++, each model extends the class NSObject.  Each NSObject has a correspective in OTCL. once a packet is received from the upper layer. parameter passing from the TCL script. trace file might occupy lots of bytes on the disk. using the Network Animator (NAM) tool. 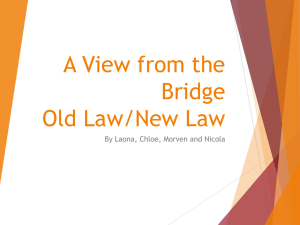 of performance metrics (e.g. throughput, delay).  External data processing tools must be used. Example: Computing the system throughput in AWK.